Bookmark this story for continued updates on BRAC’s emergency response efforts. 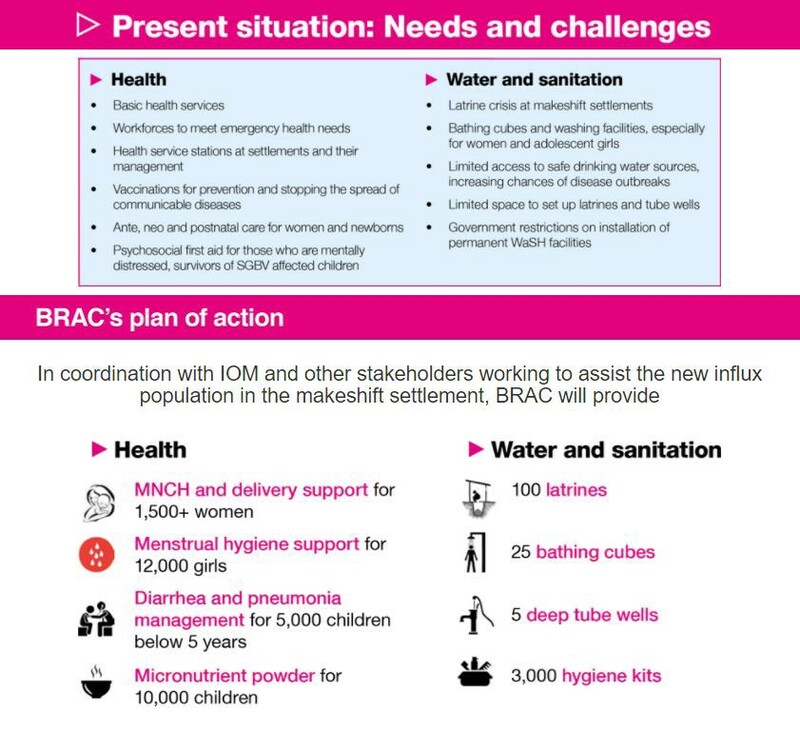 BRAC is scaling up its humanitarian assistance activities every day, focusing on maternal and child health, water, sanitation and hygiene and keeping children safe. Please visit response.brac.net to donate and follow our work. This story has been archived. 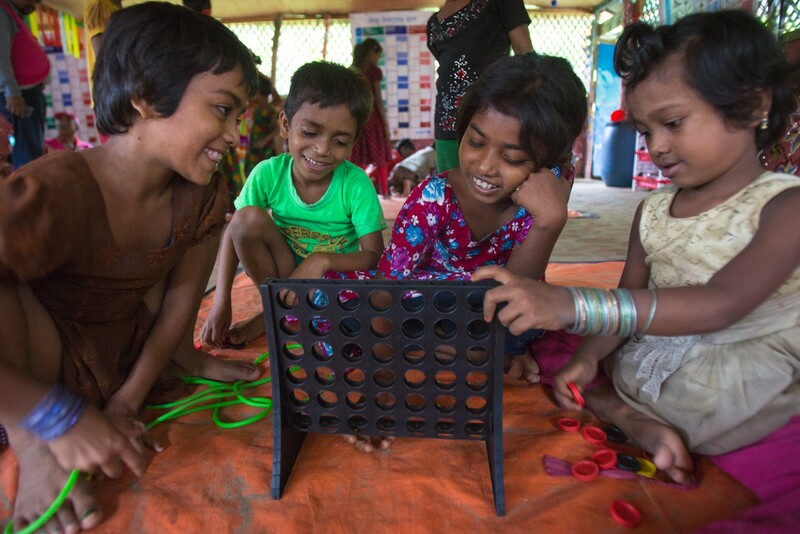 A boy from the Rakhine State of Myanmar plays inside one of BRAC’s child friendly spaces in Cox’s Bazar. 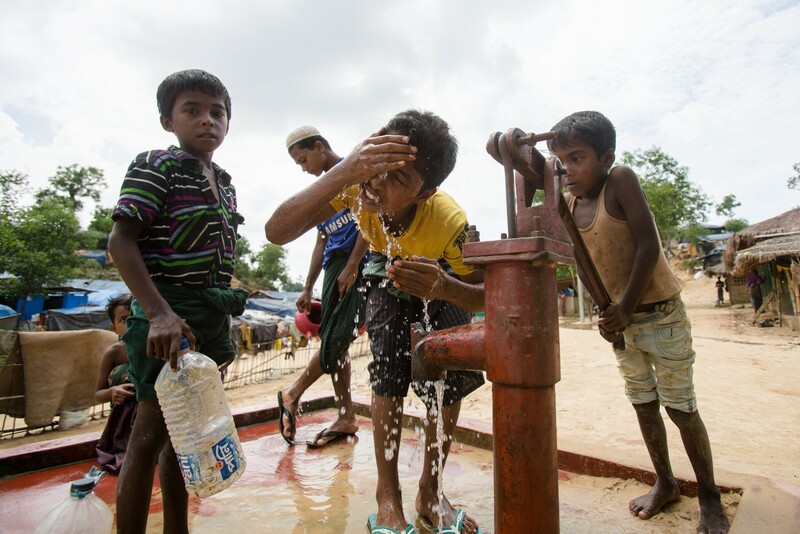 Nearly half a million people have now arrived in Cox’s Bazar, Bangladesh, from Myanmar since August 25. Of these, more than 1,500 children are separated from their parents or arrived unaccompanied. BRAC continues to provide aid as part of the Inter-sectoral Coordination Group. 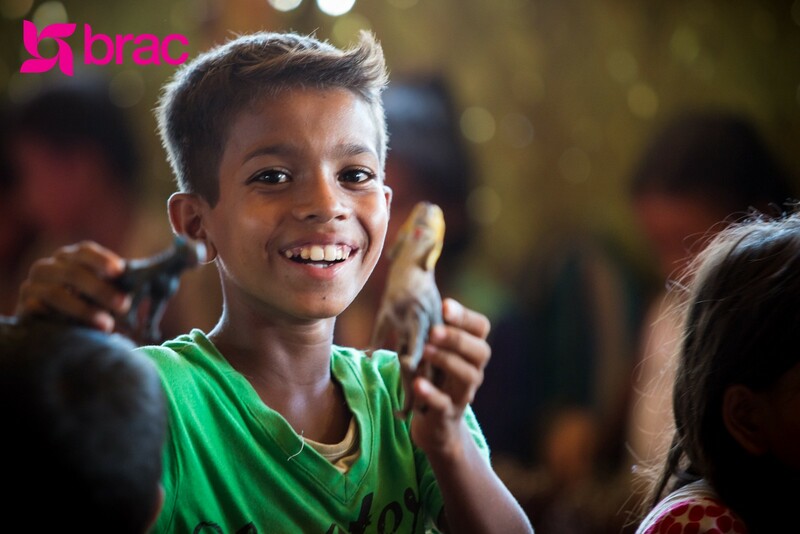 BRAC is currently welcoming 1,500 children through the doors of its child friendly spaces every day. It is treating an average of 8,500 patients daily at its 52 health camps. Sixty health and medical teams are working in coordination with ten delivery centers, supported by 20 paramedics and midwives. Another 60 field workers are working to install 15,000 latrines and more than 1,000 tube wells by mid-October. They are supported by teams of engineers and water and sanitation specialists. Almost 1,000 latrines and 400 tube wells have been constructed. BRAC has also distributed about 1,500 hygiene kits and provided supplemental hygiene education. 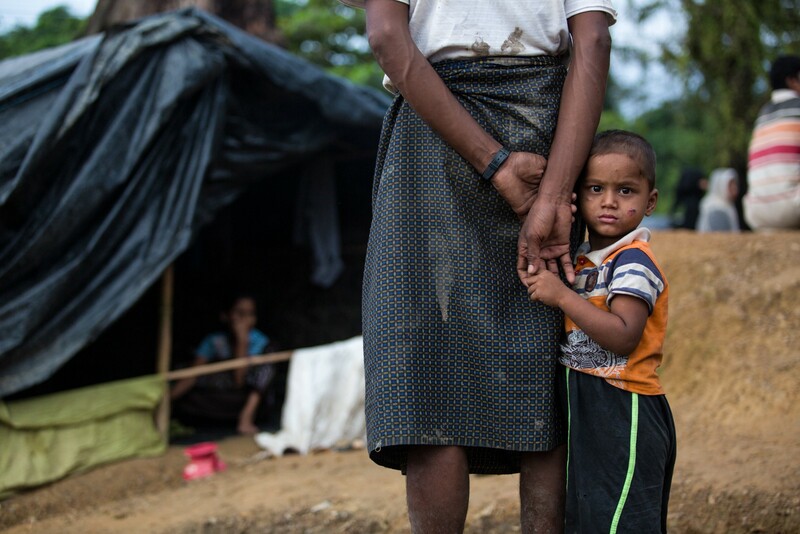 BRAC has reached more than 150,000 people living in the makeshift settlements, including 7,000 children. As the scale of the humanitarian crisis grows, new vulnerabilities, such as human trafficking, slavery, and psychological trauma, may also emerge as critical areas. 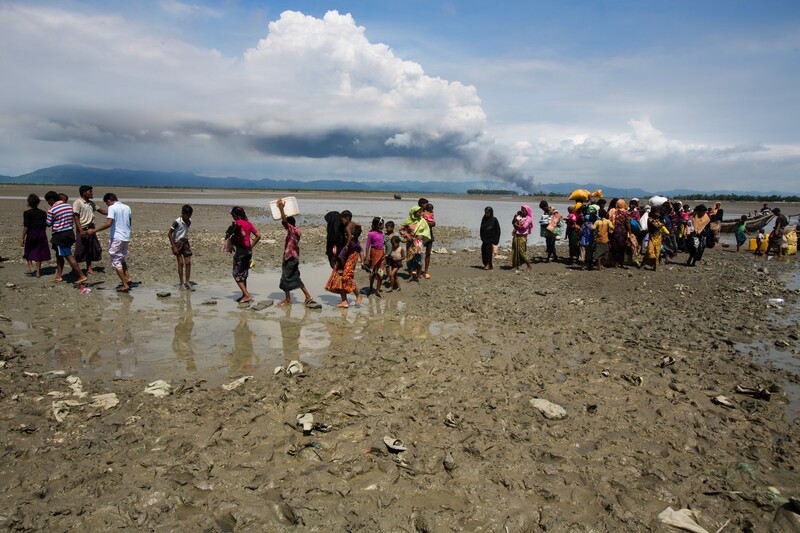 Over 400,000 people have now fled from Myanmar into Bangladesh since August 25. The situation is putting enormous pressure on a region that is already overwhelmed by recent flooding. More than half of the new arrivals are children, many of them under a year old, and many unaccompanied. More than 50,000 pregnant and new mothers have also arrived, and they also need support. Families have walked for days, and they are sick, exhausted, and scared. 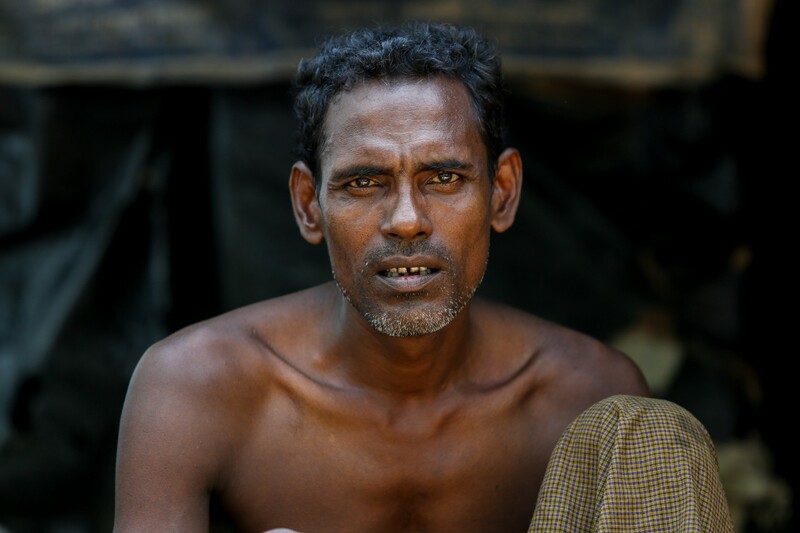 They urgently need shelter, clean water, and sanitation. 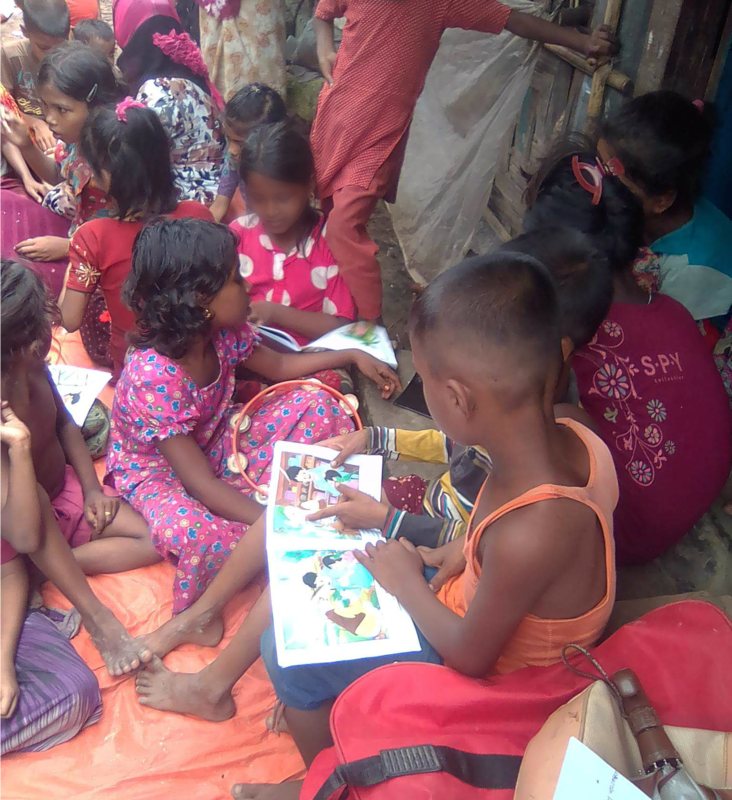 BRAC has worked in the makeshift settlement communities in the Ukhia and Teknaf sub-districts since January, providing child protection services. It is now building on those relationships to begin emergency water, sanitation, and health support for the new arrivals. 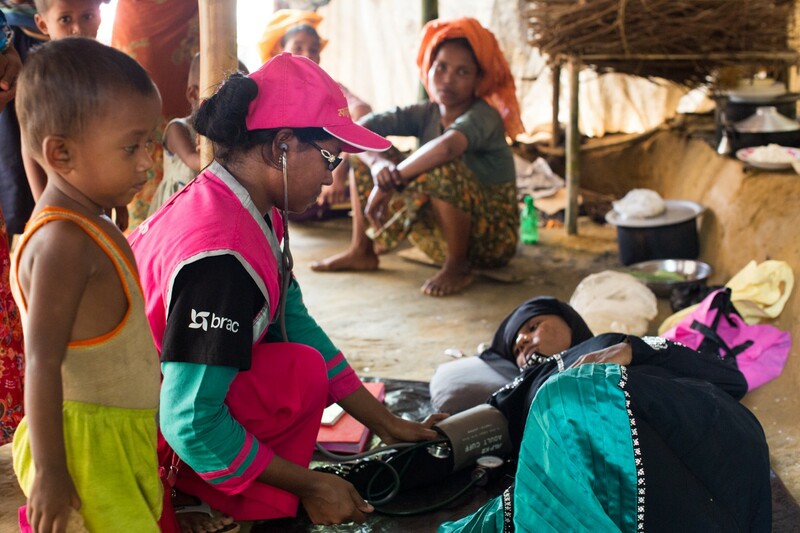 BRAC is providing immediate healthcare, focusing on maternal and child health. It also installing water sources, sanitation and hygiene facilities, and building latrines. This is in addition to a scale-up of existing child protection and recreational services. Many are responding to help, but the need is great and the resources limited. Families urgently need your support. Please donate now. And please add your claps to help share this story. 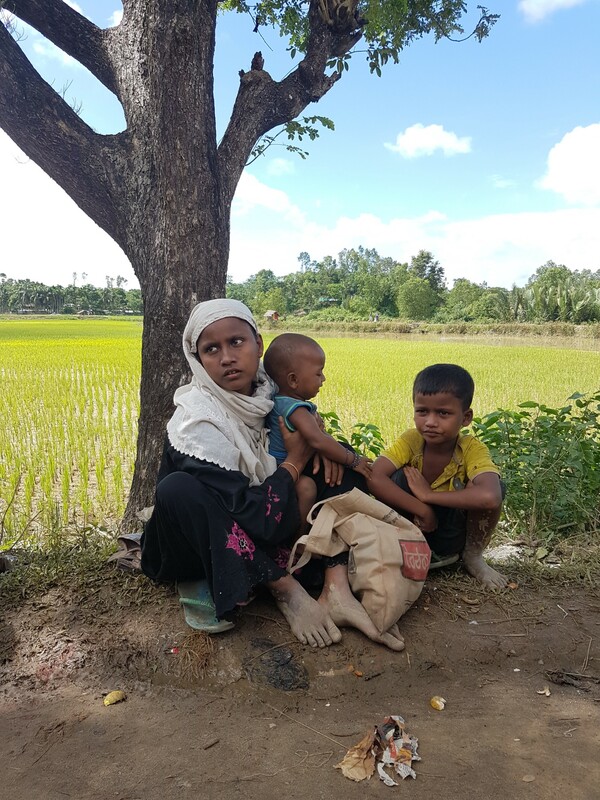 An estimated 370,000 people from the Rakhine state of Myanmar (PFRM) have crossed into Bangladesh from Myanmar since August. Large numbers continue to arrive every day, settling in densely packed sites, and more are expected to cross the border before the situation stabilizes. Many of the recently arrived represent vulnerable populations: pregnant women, new mothers, and children separated from their families. 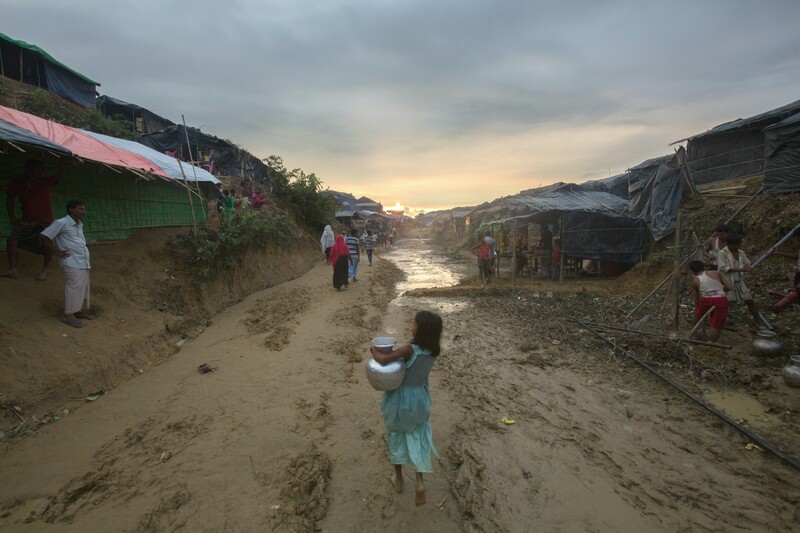 Click the image to see a 360 degree view inside a makeshift settlement in Bangladesh. Current estimates suggest that more than 50,000 children, between four and 14 years old, have entered Bangladesh since August 25. Many of these children have walked for days and they are sick, exhausted, and scared. Many are unaccompanied; they crossed the border without their parents.They urgently need shelter, clean water and sanitation. There are many people helping, but the need is much higher than the support available, and the need is growing every day. This recent influx of families from Myanmar is of great concern. BRAC is responding to support families in need with humanitarian assistance. 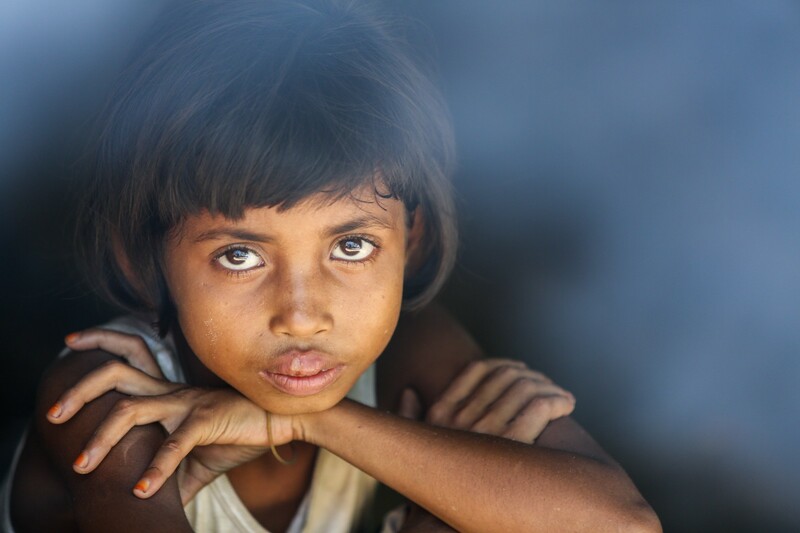 We are working to provide immediate aid to those who have just arrived from Myanmar in need of food, water, shelter, medical care, sanitation and hygiene, and other emergency support. Our activities are closely coordinated with other government and non-governmental agencies, including the International Organization for Migration (IOM), which is leading the effort, and Action Against Hunger (ACF). Many of the registered camps and settlements built earlier this year now have facilities for clean drinking water and latrines, while the newest settlements do not. In some cases, NGOs and host communities are providing bottled water and food for the new arrivals, but not sanitary toilets. As a result, open defecation is a serious and ongoing challenge, and it has significantly raised the risk of a disease outbreak. BRAC is working to support the needs of people recently arrived. We have distributed 5,000 liters of water and built 11 safe and hygienic latrines, with plans to build 15 more latrines and install deep tube wells by week’s end. We will continue to support all people living in poverty no matter their race or background, in pursuit of creating a world where every person has the opportunity to realize their potential. While flood waters have receded in most of the affected districts, more rain is forecast through the next few days. Parts of the country are at risk of mudslides, river bank erosion, and more flooding. Tens of thousands of families remain homeless in dozens of districts. Recovery efforts are underway. 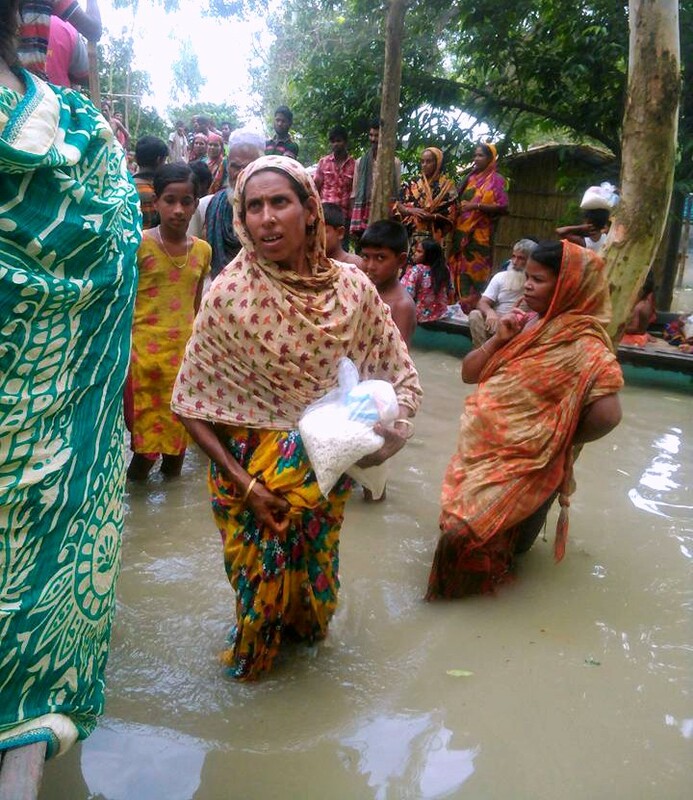 To date, BRAC’s emergency flood response has reached about 110,000 Bangladeshis. Since July, Bangladesh, a country that is no stranger to annual monsoon rains, has endured the worst flooding in forty years. Extreme rains have brought devastating floods to more than a third of the country. In some regions, the water is still rising. Families have been displaced. Life put on hold. While parents are focused on meeting basic needs, thousands of children living in temporary shelters, who have been out of school for days, face increasing risk of exploitation, injury, and abuse. Many women and girls report feeling unsafe. Water-related diseases like diarrhea, malaria, dengue, and cholera pose serious threats, and have already affected hundreds of people. 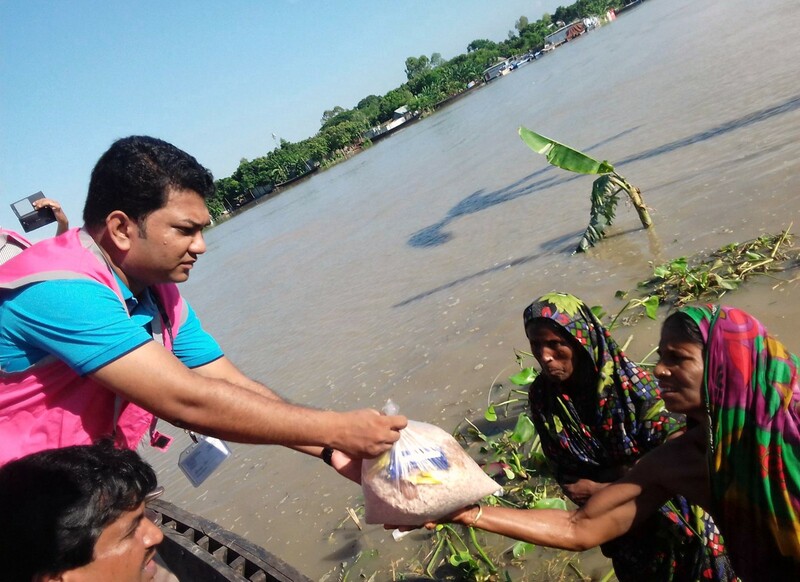 Now working across 20 districts, BRAC is providing emergency relief to more than 100,000 people in Bangladesh. BRAC staff are distributing dry food, clean water, temporary hygiene products, education materials, and other critical necessities. We’re also providing food for farm animals, a vital part of many survivors’ livelihoods. In areas where the water has receded, BRAC is helping families repair their homes. We’re making sure latrines function correctly, to limit the spread of waterborne diseases. And, we’re assessing wells in hard hit areas to test the level of poisonous chemicals in the water and ensure it’s safe to drink. In the next 24 hours, heavy rainfall and subsequent landslides are predicted in many regions throughout the country, including Chittagong, Mymensingh, Rangpur, and Sylhet. For many families, the floods have no end in sight. 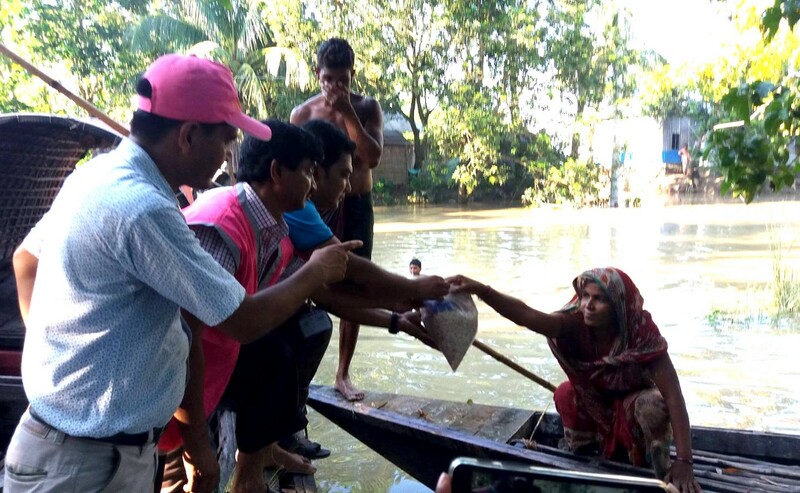 Please share our updates from the field to raise awareness about the deadly flooding in South Asia. You can also help by donating now. Low-lying areas in Bangladesh’s northeast are still under water, and the Surma and Kushiyara rivers are flowing at dangerous levels. 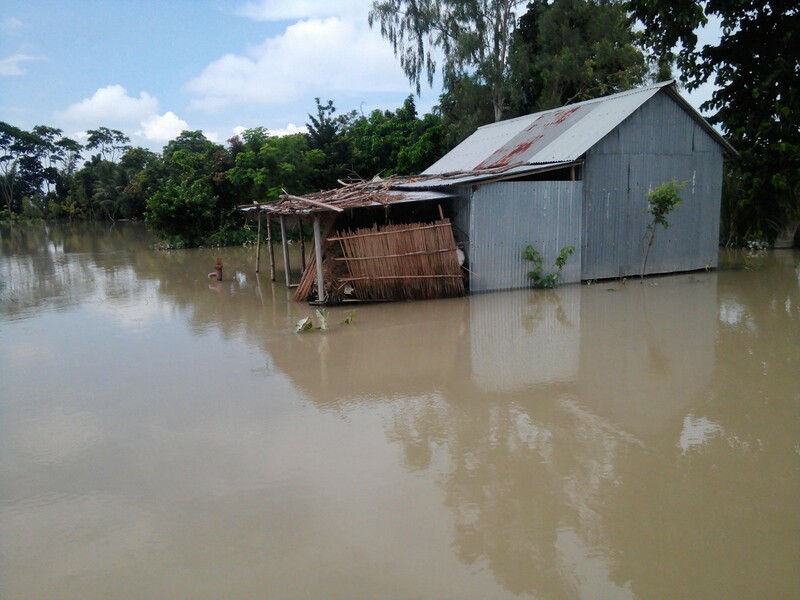 The government’s Flood Forecasting and Warning Centre reports that the Moulvibazar, Netrokona, Sunamganj, and Sylhet districts will continue to flood. 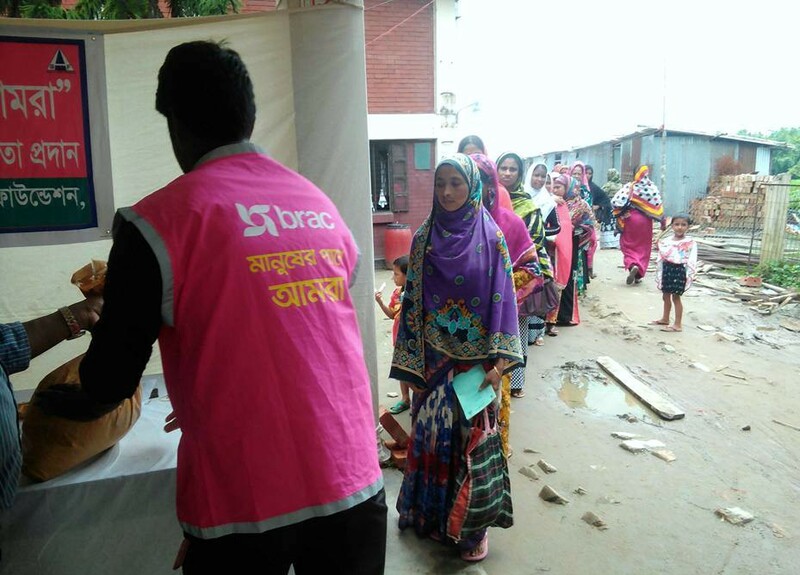 To date, BRAC has reached more than 100,000 Bangladeshis. 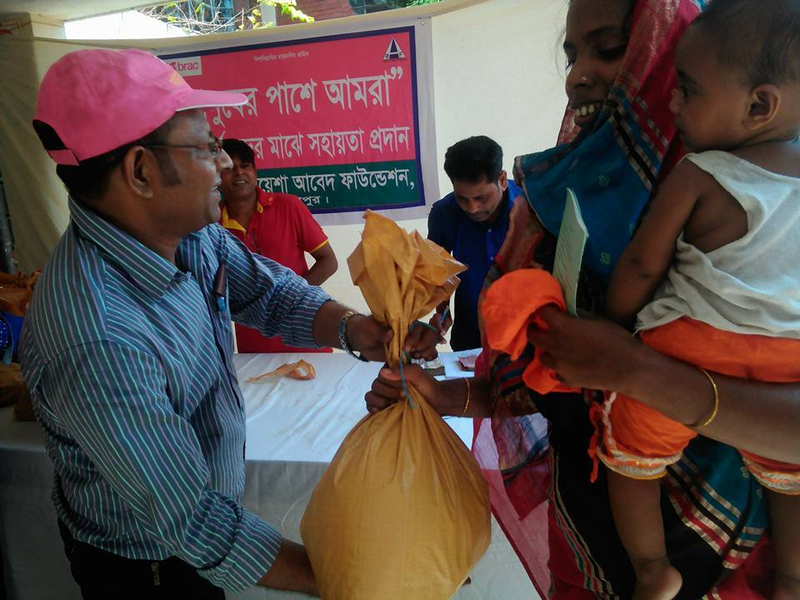 As part of this effort, bKash, the country’s largest mobile money platform, has provided relief packages to 2,000 families in isolated island communities in the Kurigram district. 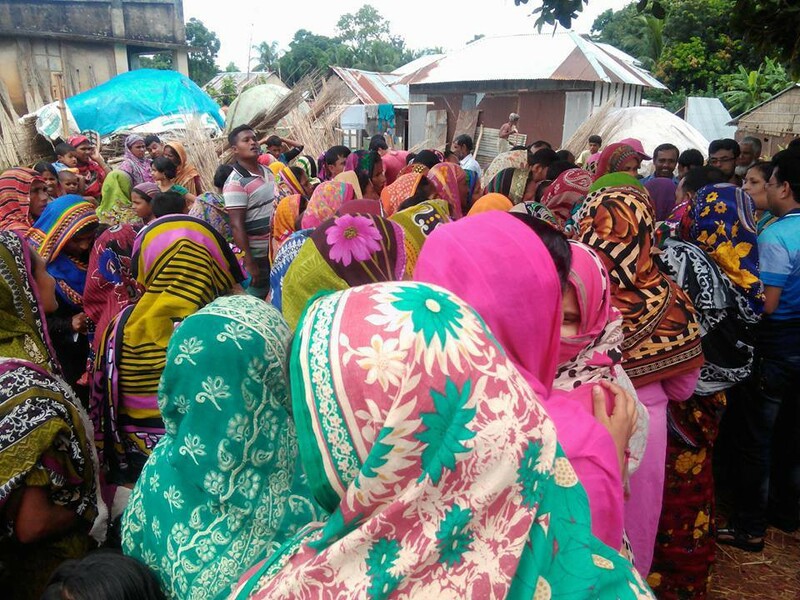 BRAC continues to provide water, sanitation, and health relief work in 20 affected districts, as well as addressing temporary shelter and housing needs. So far, it has raised about $15,000 to support families recovering from the unprecedented floods. Please donate now to provide direct relief to flood-affected families. The forecast calls for more rain, and while the water shows signs of receding in some areas, it is forecast to rise in others. 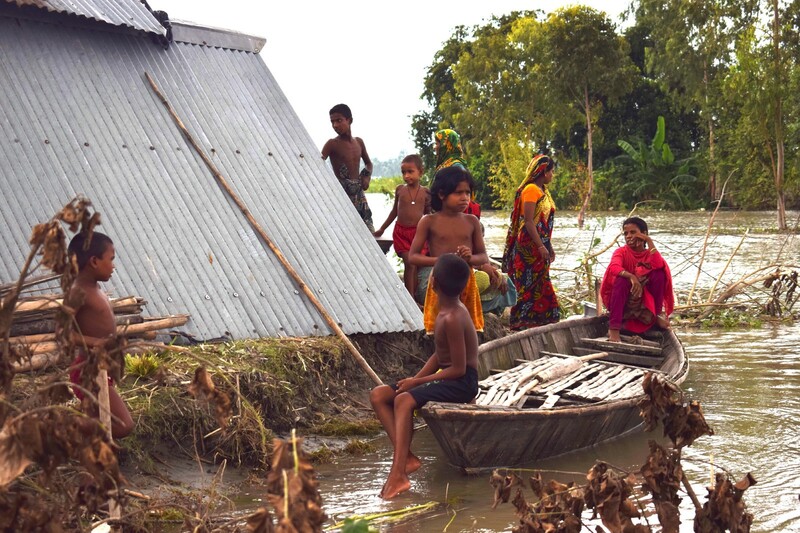 The latest government figures estimate that flooding has affected more than 8 million people in Bangladesh alone. The disaster has also caused massive damage to the country’s infrastructure, including more than 700,000 houses, 606 bridges, almost 9,000 roads, and 4,600 schools. The death toll now stands at 141. People wait in line to receive food and other forms of flood relief. BRAC has now reached more than 89,000 people, spanning 17 districts. Besides working closely with communities to assess the situation, our team is quickly mobilizing resources to deliver emergency relief to those affected. Distributed items include: dry food, temporary hygiene products, education materials, livestock feed, and more. BRAC also set up more than 300 temporary shelters for families and reopened 400 schools so children can continue their education. BRAC staff members distribute parcels of food to communities affected. 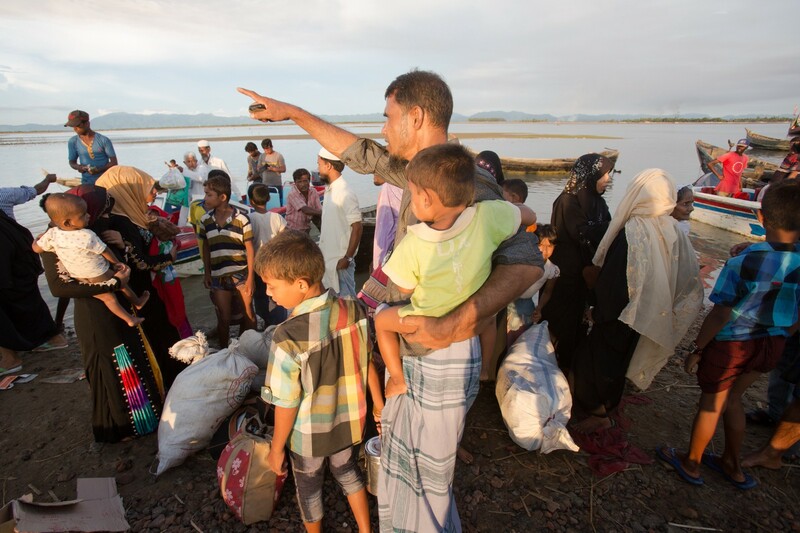 BRAC works closely with people to assess the situation and provide emergency relief. We will continue to provide updates. In the meantime, please consider sharing this post with others. To support families in need, please donate here. 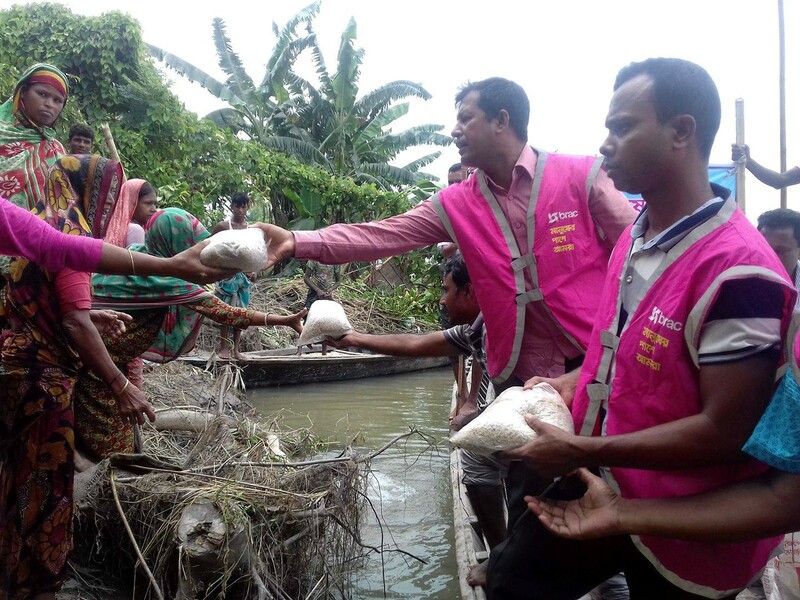 BRAC is now running relief operations across 15 districts in Bangladesh. 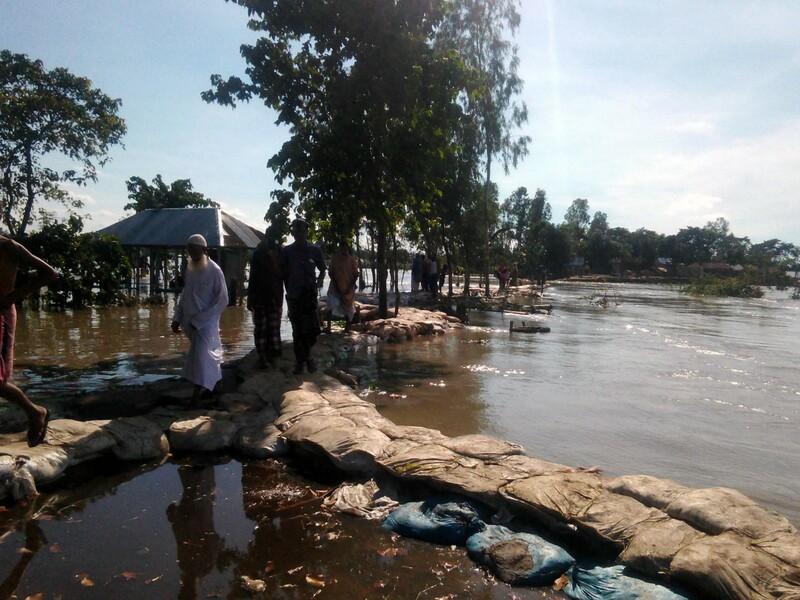 It has distributed flood aid to about 20,000 families, or roughly 80,000 affected Bangladeshis, with plans to reach more. Families have received parcels of food, clean water and temporary washing stations, access to safe and dry shelters, education support for children, and livestock feed. New estimates suggest more than seven million Bangladeshis are now affected. There have been 137 deaths recorded. On Wednesday, with such a large swath of farmland destroyed, the United Nations indicated long-term food supplies are at risk. Initiate a vaccination and de-worming campaign for livestock to prevent the spread of bovine diseases. Construct sanitary latrines and bathing cubes to address current sanitation needs, especially for women and adolescent girls. Circulate a leaflet, from the BRAC dairy food project (BDFP), on livestock health management in a post-flood context. Please donate now to help families recover. Seasonal monsoon storms have had deadly consequences for South Asia, affecting 24 million people in countries throughout the region. Tens of thousands have been displaced, with an estimated 800 dead. A flooded village in northern Bangladesh. In Bangladesh and Nepal, families are struggling to rebuild their homes and businesses. Officials are concerned about food shortages and disease caused by polluted water. 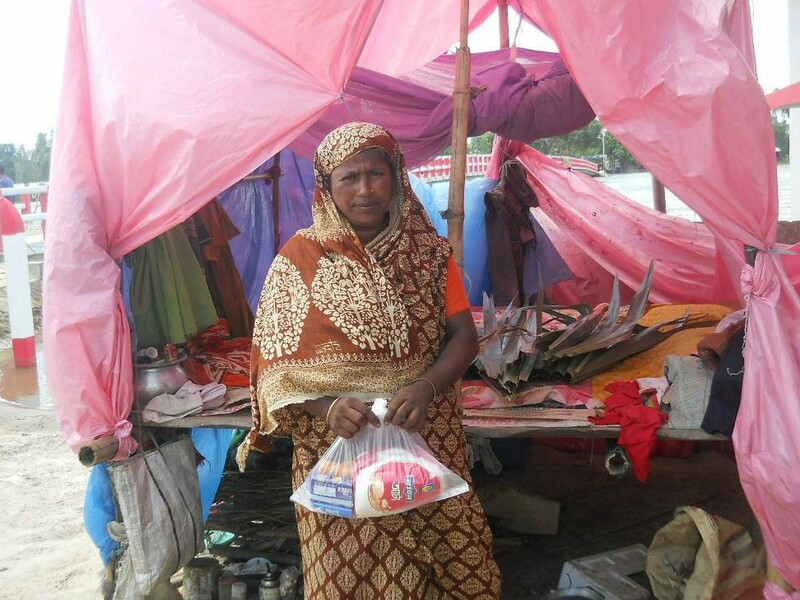 A flood survivor in Bangladesh holding a food parcel distributed by BRAC. 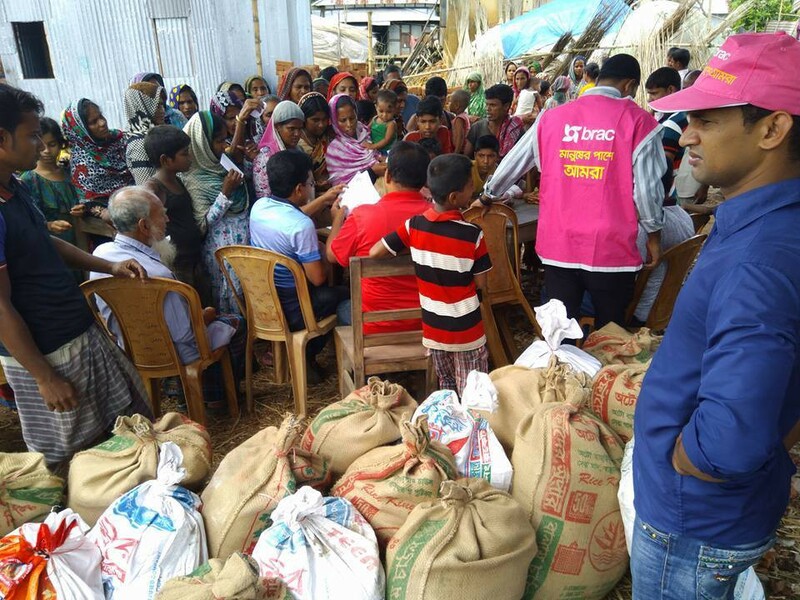 In Bangladesh, BRAC is coordinating with government agencies to provide immediate assistance to families in need across 10 districts. Almost 30,000 flood survivors have received emergency food assistance. 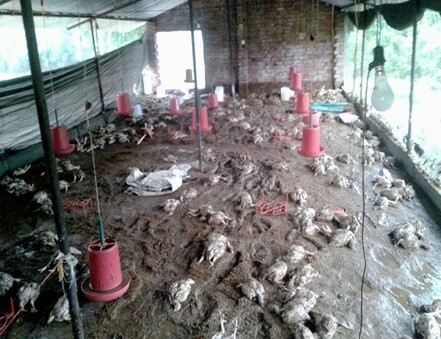 Drowned chickens represent a significant loss of livelihood for a Nepali poultry farmer. In Nepal, BRAC is working with the government and local organizations to assess the damage and develop a needs-based response. We want to help families recover their livelihoods. We also want to rebuild schools and local health clinics. Please stand with the affected families and donate to support BRAC’s disaster response and recovery work in Bangladesh and Nepal. 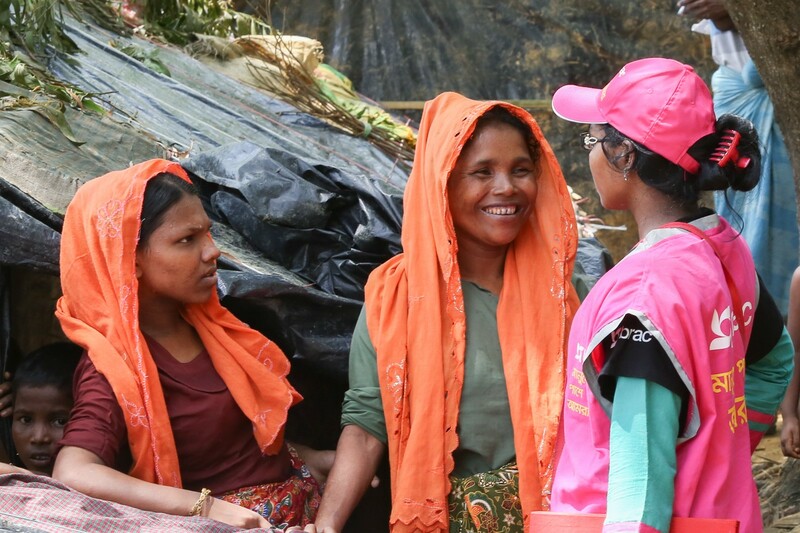 The latest from BRAC’s work to design and implement cost-effective, evidence-based programs that assist the most marginalized people in extremely poor, conflict-prone, and post-disaster settings.